My new mineral powder has arrived. The powder is not sprinkling out? Do i have to take out the sifter? NO you DO NOT take out the sifter. Each full size mineral power is packed with a clear sticker over the sifter holes to keep your mineral powder clean and tidy. You need to lift the clear sticker to sprinkle your powder out. You may choose to remove the sticker or replace it after use. How do you send my items? All our products are sent through using regular, registered or express post, insurance is a option that you can choose via check out. The above offer applies to address within AUSTRALIA only. All over seas orders rates apply during checkout. Insurance is offered and HAF Mineral Makeup Australia holds NO responsibility for lost or damaged goods in transit – Insurance claims are dealt with via Australia post only. FREE POSTAGE on selected items, this means that not all haf products are free to post. Some sale items, samples and full price DO incur a cost and YET most full size are FREE TO POST via regular post to anywhere in Australia. haf mineral makeup reserves the right to hold NO responsibility for lost or damaged goods in transit. Samples do have a shipping and handling charge and are sent via regular post unless you choose another option and or insurance. Please direct insurance claims to Australia Post on 13 13 18. Refund Policy: Due to hygiene reasons and Australian laws haf mineral makeup Australia can not refund or exchange on change of mind, incorrect colour choice, “I didn’t like the colour”. haf offers a wide range of samples for you to try before you buy. However in saying this is returns will be considered as each case can be unique. haf does not cover postage expenses in refunds or returns. When you purchase a new foundation & your previously colour was example ‘beige’ in ‘x’ brand, it does not mean that you would be ‘beige’ in all brands. Each independently owned cosmetic house name & create their own colour names & codes! Payments – are they safe? We choose paypal as they are a SECURE site! Your card details will be authorised by the bank but these details will NOT be passed back to us. We do not store credit card details within our own organisation, thus preserving your rights to privacy and protection of your card from unauthorised access. After completing this transaction successfully you will receive confirmation for the transaction via email. Do Not interrupt this process or your payment will not be received and our transaction will not be successful. Its quite simple and you’ll wonder what all the fuss was about! *Titanium dioxide and Zinc Oxide provide sunscreen properties to protect delicate facial skin from the sun’s damaging rays. *Zinc Oxide acts as a anti-inflammatory, drawing impurities from the skin without removing natural oils. *Kaolin Clay also absorbs fats from the skin, refines pores & helps clear up breakouts. *Serecite feels silky to the touch and reflects light, reducing the appearance of pores and wrinkles. Most Mineral makeup is made from naturally occurring minerals such as titanium dioxide, mica powder, serecite and iron oxides that have been used in cosmetics for thousands of years. Minerals are mined from around the world, purified, & crushed into fine powders. How Do I choose a foundation for ’Women Of Colour? Most women of colour including Indian, Hispanics and African Americans have a yellow based tone to their skin. Always choose a foundation that has a yellow hue, not every women of colour is like that so make sure you choose what is best for your complexion. Many makeup lines are realizing that women either have red or yellow hues. After washing your face wait 10-15 minutes before applying any toners or moisturisers. Then look in the mirror and you should see either red or yellow tones to your complexion. Which ever colour stands out more is the foundation hue you should choose. The best blushes for women of colour are ones that go with the complexion and look natural. Less is more when it comes to applying blush. Choose colours that are in the brown, bronze, tan, or red family depending on your tone. Many African Americans naturally have more oil in their skin. Which is why the age slower than lighter skin. Most often the darker your skin the more oil is being produced. Which just means you’ll receive wrinkles much later than most women. In the mean time to achieve a Matt shine free complexion choose powders that are one shade than you would normally choose. Oil has a tendency to make your complexion look darker than it actually is. So if your oil production is high choose a colour one shade lighter than your complexion. We offer the purest, most natural-looking form of foundation available. When applied sparingly, your face will appear flawless, yet as close the look of bare skin as possible. haf loose mineral foundation is semi-matte & can be applied dry with a powder brush or mixed with a facial moisturiser for sensitive or dry skin. Our semi-matte finish foundation provides full coverage & is long-lasting. Our formula goes on so light you’ll hardly know it’s there and you’ll have no caking! Compliment that finished airbrush look with a mist of ‘haf organic green tea face mist’ to settle makeup and get that PERFECT finish. haf mineral foundations ARE SAFE and can be worn after a cosmetic procedure such as a micro-dermabrasion session to cover the redness & promote the healing process. If you have problem skin, including conditions such as acne & rosacea, you will see an improvement in your skin when you start using our natural mineral cosmetic line and stop applying commercial brand products. Male make up Makeup For men Men’s makeup….. haf mineral makeup australia its all the same and its all suitable for men! All haf mineral makeup is suitable for male makeup use. We have numerous male clients that love our mineral makeup and organic skin range. Men like to look and feel great too with a natural spf the men are flocking in for our haf mineral makeup for foundations and also haf pure sunscreen. haf provides a huge range of shades to suit everyone including great new shades for WOC – women of colour too! African mineral foundation, Brazilian mineral foundation, Aboriginal mineral foundation, Thai mineral foundation, Arabian mineral foundation, Pacific Islander mineral foundation, South American mineral foundation, Mexican mineral foundation & many more! We are a ECO – FRIENDLY company ALL MINERAL sifter JARS ARE MEASURED BY VOLUME NOT WEIGHT SO YOU GET MORE, SAVE YOUR MONEY & HELP TO SAVE OUR PLANET! A 20g pot of PURE haf mineral foundation is all that you need. haf minerals are so pure you dont need as much as other brands promote ( they have fillers) . Pure minerals go a very long way so less is always more! We add sifter seals to assist with easy application. We have such confidence in our product & have nothing to hide that we display all our ingredients ’ clearly’ on each & every product! All haf products are cruelty-free. No animal testing. Natural Ingredients Titanium dioxide, sericite, iron oxides, mica & ultramarine blue. We also offer all our foundations in 3g sample pots so you can feel confident in choosing the right colour! Our loose mineral foundation makeup have Sifter Seals – keep your product in the same way that it was packed – neat & tidy! Having sifter seals in your mineral powder product pots also make application easy. Note that pictures are not true to scale in size. Colours seen throughout this site may vary from monitor to monitor. Colours are a approximation. To test/try accurate colour match click on ‘samples’. 125 Buff Rose: For light beige with toned down pink and slight ash / grey undertones. 114 Nutmeg: For medium dark brown skin, with undertones of red & bronze. 118 Expresso: For the darkest of skin with red and blue undertones. 122 Simply White – Stage: A foundation exactly as it sounds. Simply white. 102 Golden Wheat: A shade for light skin with pink or neutral undertones. Fits in two categories. 127 Natural Wheat: A shade for light skin with pink & neutral undertones. A combination of Golden Wheat and Beige. 110 Beige: A light medium shade. It has great balance. 124 Medium Buff: For medium tanned skin by sun or tanning bed, with slight yellow undertones. 104 Golden Tan: Our lightest medium shade for tan skin. The same shade as Dark Tan with a little more pink. 111 Dark Tan: For medium skin, with neutral to pink undertones. For tanned skin by sun or tanning bed. 105 Honey Beige: For medium skin, a rich caramel-brown for darker skin with undertones of gold, red & bronze. 107 Sable: For classic medium-dark complexions with red undertones. 108 Mocha: For dark/ rich espresso skin, red & golden undertones. 102 Golden Wheat: A shade for light skin with yellow to neutral undertones, and some pink undertones. A balanced colour. 113 Sandstone: For light-medium skin with both yellow/neutral undertones.116 Natural Honey: For medium skin, neutral to golden undertones. For lightly tanned skin. 115 Dark Honey: For medium skin, caramel brown for darker skin with undertones of gold & bronze. 106 GoldenBisque: For medium-dark skin with undertones of yellow/gold and bronze. 1. Use clean pair of haf professional tweezers when you neaten your brows. 2. Clean the brow area with some methylated spirit or astringent. This helps to reduce the pain & clean the skin area of oils. 3. Pluck your brows after a hot bath – this will open up your pores & it will hurt less! 4. Remember never to pluck against the grain – that is, you should pluck your hair in the direction of its growth. To complete the look, you should fill in your brows with some hf brow colour or mineral pencil makeup. Instead of the harsh look of a pencil-drawn eyebrow. 1. Use your haf angle brush with bristles. This gives you more control when you apply the brow makeup. 2. Swipe the brush over an eye pencil nib to get some colour. 3. Apply this over your brows, shaping as you go along with the brush. 4. After this, brush with haf brow brush for a more blended and smudged look so it appears very natural. You will also be brushing & styling them too! 5. To finish them off apply a extremely small amount of hf natural lip lube & brush them into shape again. This will keep them in place, give natural looking shine and train them in the direction that they should be going. This great makeup tip never fails! 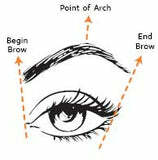 Your brows will look polished & neat & you will see the difference between drawing your brows with a pencil & a brush. You have to bear in mind though, that this trick will be ineffective if you have messy brows – so do remember to neaten / pluck the strays on a regular basis.